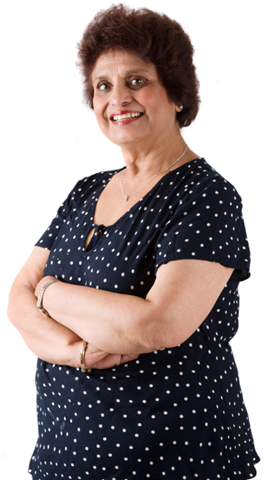 Diabetes Mellitus (DM) is considered one of the most common chronic diseases worldwide. The prevalence of DM (HbA1c>6.5%) in SA is reported to be 9.6%, while 19% of the population has impaired glucose homeostasis (HbA1c >6.1 and <6.5%). Research is ongoing to find measures to slow down the onset and increase of DM. Poor diet and lifestyle factors (lack of exercise and obesity) seem to play the biggest role in the development of type 2 Diabetes Mellitus (T2DM). Medical nutrition therapy guidelines recommended for the management of DM includes following a healthy, balanced eating plan, with the optimal combination of macronutrients individualized for carbohydrates and fat. It is advised that a variety of protein sources be consumed with a reduction in the intake of red meat,concomitant with an increase of nuts and low-fat dairy products. The role of dairy consumption has received considerable attention lately with conflicting results reported in the literature. Ranging from a significant inverse association between dairy consumption and risk of T2DM, to no significant associations. 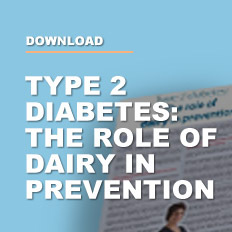 An Australian 5-year study found that dairy intake independently reduced the risk of DM. In another 10-year study, those with the highest intake of dairy had a 59% lower risk for the development of Metabolic Syndrome. Although the risk for DM was also lower in the same group, it was not consistent and significant. Other studies reported the intake of cheese and fermented dairy products to be inversely associated with fasting plasma glucose and 2-hour post prandial glucose values. Similarly, total dairy intake was not significantly associated with incidence of T2DM in the 10-year Whitehall II cohort study. Although an inverse association was found between fermented dairy product intake and mortality, none was observed with T2DM incidence. Association between the intake of dairy products, as well as the various types of dairy products, and the risk for T2DM. 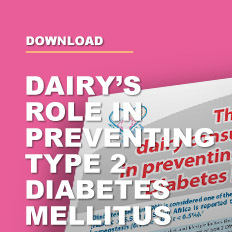 Consistent and significant evidence that the consumption of dairy products reduces the risk of T2DM have also been reported by meta-analyses performed (2010 and beyond). High intake of dairy products as a whole was associated with a significant reduction in the risk of T2DM ranging from 11 – 15%. A significant inverse association was reported between low-fat dairy consumption and risk for T2DM where the consumption of low-fat dairy resulted in a 10% – 19% lower risk for T2DM. Similarly, a significant inverse association was reported between low-fat milk; cheese, yoghurt and fermented dairy product consumption and risk for T2DM. No significant association was found between full-fat dairy, total milk and full-fat milk intake and risk for T2DM. A threshold of 200g per day for total dairy intake was reported for the best risk reduction with the largest reduction found with lower intakes. With higher intakes, although the association was still significant, risk reduction was more modest. No additional benefit was found with intakes exceeding 300-400g per day. For low-fat dairy, 300g per day was reported for the best risk reduction. No additional benefit was found with intakes exceeding 400g per day. In the case of yoghurt, intakes exceeding 120 – 140g per day provided no further risk reduction. 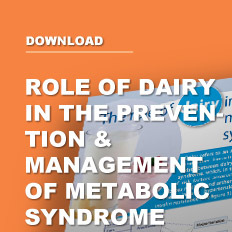 The question can be asked whether the positive association found between dairy consumption and reduced risk of DM could be due to the higher intake of protein and amino acids in general, or whether it should be ascribed to the individual nutrient components of dairy. As discussed, dairy products has been inversely associated with reducing DM risk. Lower fat dairy products produced stronger associations than full fat dairy products, suggesting that dairy fat is not the only important nutrient to consider. In order for an intervention to be effective, it would need to influence and change the risk factors resulting in the development of T2DM. Hence, manipulation of insulin receptor sensitivity, insulin secretion and/or reducing insulin resistance would be effective in targeting primary causes of DM. On the other hand, any changes in lifestyle associated risk factors (decrease in weight or prevention of weight gain; drop in blood pressure, increasing satiety) would be equally effective. In the light thereof, various mechanisms could thus explain the inverse association between intake of dairy products and reduced risk of T2DM. Milk and dairy products have an abundance of calcium, magnesium and vitamin D. The positive effects of these nutrients include its role in increasing insulin receptor expressionand improving insulin sensitivity, beta-cell function, decreasing fat absorption, increasing weight loss and reducing blood. It also aids in weight loss by means of increasing the thermic effect of a meal and fat oxidation. Dairy protein specifically, such as whey protein, is known to increase satiety and lower blood pressure pressure. The prevalence of DM in South Africa is alarmingly high with nearly 10% of the population suffering from the condition. Every effort should be made to curb the growth effectively. Medical nutrition therapy guidelines include being physically active and following a balanced diet, including a wide variety of foods. The daily intake of dairy products, especially low-fat options, significantly reduces the risk of developing DM and should be encouraged. 1. Shisana O, et al. 2013. South African National Health and Nutrition Examination Survey (SANHANES-1). Cape Town: HSRC Press. 2. ADA. Diab Care. 2013. 36 (suppl 1): S11 – S66. 3. Pan A, et al. Am J Clin Nutr. 2011. 94: 1088 – 1096. 4. Feskens EJM, et al. Curr Diab Rep. 2013. DOI 10.1007/s11892-013-0365-0. 5. Lazarou C, et al. Crit Rev Food Sc Nutr. 2012. 52: 382 – 389. 6. Grantham NM, et al. Public Health Nutr. 2012. 16: 339 – 345. 7. Gao D, et al. PLoS ONE. 2013. 8: e73965. 8. Aune D, et al. Am J Clin Nutr. 2013. 98: 1066 – 1083. 9. Tong X, et al. Eur J Clin Nutr. 2011. 65: 1027 – 1031. 10. Louie JCY, et al. Nutr Metab Cardiovasc Dis. 2013. 23: 816 – 821. 11. Struijk EA, et al. Nutr Metabol Cardiovasc Dis. 2013. 23: 822 – 828. 12. Sluijs I, et al. Am J Clin Nutr. 2012. 96: 382 – 390. 13. Soedamah-Muthu SS, et al. Br J Nutr. 2013. 109: 718 – 726. 14. Elwood PC, et al. Lipids. 2010. 45: 925 – 939. 15. Cândido FG, et al. Nutr Hosp. 2013. 28(5): 1384-1395. 16. Weickert MO. Clin Endocrinol. 2012. 77: 508 – 512. 17. Kalergis M, et al. Front Endocrinol. 2013. 4: 1 – 6. 18. Yerlikaya O, et al. Crit Rev Food Sc Nutr. 2013. 53: 902 – 908. Bo S & Pisu E. Curr Opin Lipid. 2008. 19(1):50-56.